What happens when rates rise? We have been asking this question all week, in preparation for next week’s potential decision by the Federal Reserve to raise interest rates for the first time in nine years. At present, the market judges the chance of such a move as only about one in four, and this sounds accurate to me. A rate rise now seems unlikely, but it is far from out of the question. So, here is a Long View guide to what will happen to different assets when rates rise. First and most clearly, there are the effects on commodities and currencies. A rate rise — particularly if part of a longer term cycle of rising rates — directly strengthens the dollar, and therefore weakens assets priced in dollars. It would bring money flowing back to the US. The dollar would be strong, while the downward pressure on oil and industrial metals would remain. As a rate rise would be seen as deflationary, it would weigh on the gold price as well. In emerging markets, we have already had several dress rehearsals for a rate rise. If it comes, it will accentuate the pressure on emerging market currencies, which is already severe. Since the last round of emerging market crises, there have been moves to lower government dependence on dollar-denominated debt, but there is plenty of corporate dollar debt out there. The effect would be more differentiated than in previous crises. But those countries with current account deficits could expect to feel the pressure — led probably by Brazil. With equities in the US, the picture is far more complex. The move has been so widely telegraphed that investors should have prepared for it. Historically, there is no direct correlation between the start of a rate-rising cycle and falls in equities. Such moves normally come when the economy is humming along well. When animal spirits are high, a rate rise can even be seen as a declaration of faith in the economy from the Fed. But earnings growth has flattened out this year, stocks have already suffered a correction, and a rate rise would not be taken that way. People are nervous. Ultimately, equities’ reaction will depend on what happens to the fixed income and credit markets. Here, the effect is less open to conjecture. Higher target rates set by the Fed will send bond yields higher, which means bond prices must go down. With yields already low, the proportionate falls in prices need to be that much greater. Further, the greatest falls will come for the assets with the greatest duration — the technical term for measuring bond price sensitivity to changes in interest rates. Generally, risks are greatest when they are not perceived. People who have bought a security believing it to be high-risk tend to guard themselves against that risk; those who think they have a low-risk investment do not. This could therefore amplify the risk of a full-blown financial “accident”. Unexpected and unhedged losses can lead to knock-on effects. But the credit market is lumpier than the stock market. Rather than trading on an exchange, those who want to buy or sell bonds do so through a dealer, generally at a bank. Since the financial crisis, banks have cut back drastically on the capital they allow their dealers to spend holding bonds or credit instruments. This has been done in large part under regulatory pressure, and it means there is far less money available for buying bonds. Meanwhile, the amount of bonds in issue has increased in the years after the crisis, as part of the financial engineering encouraged by low interest rates. Companies have issued debt and used it to buy back stock. That raises the spectre of many eager sellers failing to find a willing buyer, and watching as prices plummet. Again, there have been dress rehearsals for an incident like this, both in the past few weeks, and during the bond market “flash crash” last October. Credit markets drive financial crises. If they freeze, then stocks will come thudding down — as happened during the crisis of 2008. That is the imponderable “nightmare scenario” that faces markets. Just how badly would the credit market react to a rate rise? It can only be answered once rates rise. And that is why many in markets do not want to find out just yet — and why the bet is on that the Fed will decide not to find out either. Now, all that remains is to wait a few more days and find out what the Fed decides. And those of us who are not central bankers should probably offer up prayers of thanks that we do not have to make the decisión. Emerging markets have accumulated $7.5 trillion of external debt and are acutely vulnerable to a rapid rise in US interest rates, regardless of whether they borrowed in dollars or their own currencies, Fitch Ratings has warned. The credit agency said international markets are pricing in a much slower pace of US monetary tightening than the US Federal Reserve itself, risking a potential financial upset in East Asia, Latin America and Africa if Fed hawks refuse to bow to market pressure over the next two years. Fitch said the Fed has signalled a rise in rates to 3.8pc beyond 2017 but investors simply refuse to believe that this will happen, with futures contracts implying rates of just 1.4pc over the same span – an unprecedented gap of 240 basis points, and one that is fraught with risk. The warning comes as the Fed decides this week whether to raise rates for the first time in nine years, despite worries about China and the sharp sell-off in global equities in August, or whether to delay yet again until the dust settles. Traders say the likelihood that the Fed will pull the trigger on Thursday has fallen to 28pc. Andrew Colquhoun, Fitch’s senior director, said the pace of Fed tightening has powerful implications for emerging markets, which levered their economies to the hilt during the era of excess liquidity from Fed largesse and zero rates. “An outcome closer to the Fed’s own guidance would be a shock,” he said. External debt in these in these countries has increased by $2.8 trillion to $7.5 trillion since the Lehman crisis. The most extreme rise has been in Latin America, where gross external debt has jumped by 118pc. The Fed ignored evidence of mounting stress in emerging Asia and Russia in 1998, continuing to talk tough into the teeth of the storm, insisting that it would set monetary policy purely in the interests of the US. This proved to be a mistake. The bank was forced to slash rates three times in emergency moves after its insouciance triggered a full-blown crisis in the East Asia and set off systemic contagion across the world that quickly reached the US itself. William Dudley, the head of the New York Fed, said in April that the US authorities are highly sensitive to knock-on conditions in emerging markets, knowing that any misjudgment could come back and bite the US itself. The Fed has recruited Stanley Fischer as vice-chairman because of his veteran experience with global market forces, both as former governor of the Bank of Israel and an-ex official at the International Monetary Fund. But it is still not clear how much the bank will bend to prevent collateral damage in emerging markets. Loans are growing at a fast clip of 7.8pc. The broad M2 money supply is growing at a 6.2pc pace, and narrow M1 at 8.4pc, data that would normally imply a buoyant economy six to 12 months ahead. Some monetarists have already begun to warn that the Fed is badly behind the curve. Mohamed El-Erian, from Allianz, said it is likely to be the “loosest tightening in history” but that is not the historical pattern of Fed behaviour. Leading governors are loathe to give the impression that they are being pushed around by markets, and they may conclude that quantitative easing by the Bank of Japan and the European Central Bank is enough to keep global finance supplied with liquidity. Oddly, at the latest G20 meeting the central bank governors of Mexico and India called for the Fed to lance the boil immediately. “I found that very peculiar. There is no inflationary pressure and no reason at all to raise rates now,” said one official who attended the event. Unlike the emerging markets borrowing sprees of the 1970s or early 1990s, private companies are this time responsible for most of the debt. Yet sovereign states have also been raising funds abroad at a brisk pace, issuing $1 trillion of external debt since the Lehman crisis. Half is in dollars or other foreign currencies. Fitch said many of these countries have fat reserves and a range of external assets, but the sheer quantity of debt still leaves them vulnerable to a rate shock. Each rise of 50 basis points in US interest rates historically leads to a 16-point rise in yields on the JP Morgan Emerging Markets Bond Index. A new study by the Bank for International Settlements found an even bigger knock-on effect, with an average move of 43 points in emerging markets for every 100-point move in US rates. The BIS said developing economies risk a double squeeze if the Fed tightens hard and pushes the dollar higher. The currency burden of their debts would rise, and the ratchet effect of higher interest rates would tighten the monetary noose. While countries can dip into reserves to stop their currencies falling, this automatically entails monetary tightening and makes any credit crunch even worse. As China is discovering, huge reserves cannot easily be deployed in recessionary conditions. They are a Maginot Line. The BIS said the Federal Reserve must move with great care, if only in its own “enlightened self-interest”. It has been nearly three years since we published our first Outlook Report in December 2012. Since the beginning of our publication, we have focused on different aspects of the gold market and have analyzed what moves the gold market. In this article, we would like to re-examine some of the topics that we had previously discussed and analyze whether any of our assumptions have changed. Financial repression has been a frequently discussed topic since our first publication. During that period, many of the measures we had warned about are now in place or events have already taken place. A good example is capital controls. In 2012, a discussion about the possibility of capital controls in a Western country seemed like a conspiracy theory. In the meantime, they became a reality in both Cyprus and Greece. Could a major Western country be next? We also warned about negative interest rates. At that time, they were observable in some short dated government bonds. The ECB and Swiss National Bank have both now lowered deposit rates into negative territory. The results: Swiss government yields are negative for terms up to 10 years. Imagine! As an investor you have to actually pay the Swiss government so that you can lend them money for 10 years. It is absurd, if you think about it. The same is true for several other European government bonds. One thing that we had predicted didn't become reality yet: Consumer Price Inflation. Although asset price inflation is very prevalent and real estate and equity prices have increased rapidly, we did expect consumer prices to pick up more quickly. However, this can always change ... very quickly. Another topic that we have been discussing for years is the debt level. Debt and interest are not bad by themselves. The principal problem is when we have a currency system that is based on debt. Why? Since debt has to be repaid with interest, if the money supply does not constantly increase debtors will default. It is inherent to the system that the money supply has to constantly increase to avoid a collapse, and this in turn reduces the purchasing power of money. So, do we still have a debt problem? Yes, we still have a debt problem, but it has gotten worse. My good friend Ronald Stöferle, the author of the publication "In Gold we Trust", developed the chart below. The result is striking! Between 2007 and 2014, the total global debt increased by over 40%. 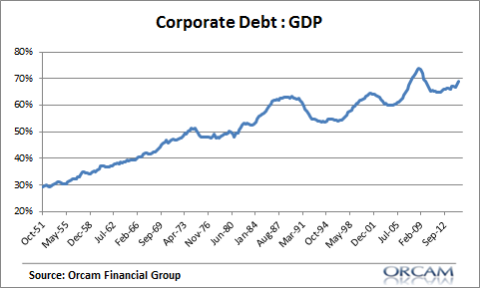 Governments, financials, corporations and households have all increased their absolute debt levels in the last few years. The chart shows that total global debt has reached 200 trillion USD. World global output measured by the gross world product was around 76 trillion USD in 2013. This means that on a global scale we have a debt ratio of approximately 270% of the total yearly world output. In summary: The debt situation has become worse in the past few years. It has reached an unsustainable level. However, unsustainable situations can continue to persist for some time. 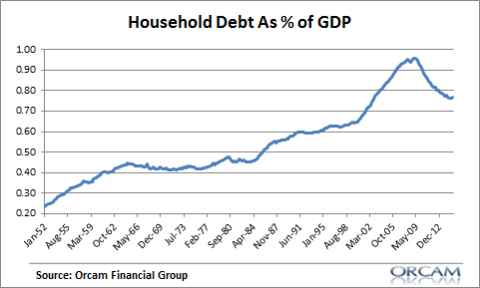 The question is not if, but rather when this debt bubble will pop. Where is the gold price heading? When clients ask me where the gold price is heading, some of them are surprised to hear that I don't actually have a target price for gold. The reason why I personally hold gold is because I see it as an insurance against our current monetary system. It is one of the only assets I know that has no sort of counterparty risk and has been considered to be of value for thousands of years. Do I follow the gold price constantly? No! Do I regret owning precious metals when the price stays stable or declines in USD? No, not really, the same way that I don't regret owning health insurance, when I stay healthy. I would like, however, to make one observation in regard to the gold price. It becomes clear when we look at the chart below. Since the 2008 financial crisis, central banks worldwide have pumped a massive amount of liquidity into the markets. Much of this liquidity has ended up in "bankable assets" i.e. equities and bonds. Since their lows in March 2009, both the S&P 500 and the German DAX have had triple digit gains of almost +170%. At the same time, the real economies have more or less stagnated. In the meantime, the price of gold has increased by 21% during the same period. Which asset do you think is more at risk of being in bubble territory? Which one do you think has a bigger upside? I leave you to draw your own conclusions. The demand for gold from central banks has remained stable over the last few years as shown in the chart below. Interestingly, the Russian central bank had the largest gold purchases during the first half of 2015. It purchased a total of approximately 70 metric tons. This is interesting since during this period Russia has been under increased scrutiny and has even had sanctions placed on the country. It appears that the Russians want to stock up on the one currency that can't be "frozen" and will always be accepted. Overall, our Outlook remains unchanged! The reasons why we believe it is crucial for seasoned investors to hold gold have not only remained unchanged, but have become even more urgent. We would also like to go one step further. As governments worldwide become increasingly desperate due to their dire financial circumstances, I believe that they will resort to increasingly tyrannical means to access the wealth of their citizens. It is essential to keep at least a part of your assets far away from the banking system, which I consider to be an "extended arm" of the government. I recommend that if you are looking for a real way to secure your assets, they should be kept physically outside the banking system. It would be ideal if they were in a jurisdiction that has never confiscated precious metals in the past. How Will the Fed Reverse Quantitative Easing? Very Carefully. Can the Federal Reserve run down its huge security portfolio without causing problems for monetary policy? The world is waiting for the Federal Reserve’s Open Market Committee to begin raising interest rates. But there’s another important issue waiting offstage: The Fed says it will adjust its bloated balance sheet after interest rates begin to rise. But when, and what does that really mean? Quantitative easing resulted in the purchase of $4.2 trillion of mortgage-backed and Treasury securities and the creation of $2.6 trillion of excess reserves. Like everyone else in the world of finance, the Fed needs interest income from its securities portfolio to pay for the costs of interest on excess reserves, its new monetary tool. As the FOMC begins raising rates, the costs of its new tool will rise simultaneously. When the FOMC increases the federal-funds rate to 3.75% by increasing the interest rate paid on excess reserves to 3.75%, that will usurp all of the Federal Reserve’s earnings, and our central bank will become a borrower from the Treasury, rather than a provider of funds. This would be a huge embarrassment to the Fed because it has credited the Treasury with its annual earnings for decades. Those earnings credits are now $100 billion annually because of the bank’s unusually large securities portfolio—and the Treasury has become accustomed to this windfall. So the first order of business for the FOMC is to get the costly excess reserves off the Fed’s balance sheet so it can revert to its traditional means of controlling rates through the purchase and sale of short-term Treasuries. Those trades are far less costly. In order to do this, the FOMC must first re-establish the fed-funds market as our banking industry’s primary source of liquidity. Banks now rely on excess reserves for this purpose because the FOMC collapsed the fed-funds market with its prolonged near-zero interest-rate policy. Moreover, banks are able to purchase funds in the short-term Treasury market from participants ineligible to hold reserves and willing to accept less than the fed-funds rate when selling funds and to arbitrage these in their reserve accounts. Step No. 1 in re-establishing the fed-funds market is initiating rate increases to give the market room to operate. Somewhere between zero to 0.25%, where the fed-funds rate is now, and 3.75%, the FOMC probably will revert to relying on the purchase and sale of short-term Treasuries to control interest rates. Then the FOMC can cleanse the Fed’s balance sheet of all excess reserves simply by paying no interest on them once again. A tricky part in this transition is maintaining the availability of an effective monetary tool, so that the FOMC doesn’t lose control of interest rates and also doesn’t create problems for banks. If, tomorrow, the FOMC stopped paying interest on excess reserves, it would lose its monetary tool and thus control of interest rates. Banks would be required to redeploy $2.6 trillion into an economy awash in liquidity, further complicating the transition. In addition to the FOMC’s forcing banks to rely on their $2.6 trillion of excess reserves for liquidity purposes, the Fed’s regulatory actions since the crisis of 2008 have been directed at filling banks’ balance sheets with capital and liquidity and promulgating rules, regulations, and stress tests to avoid a recurrence of a taxpayer bailout. But the Fed also effectively tightened lending standards, dampening lending and deployment of banks’ excess liquidity. THE BALANCE SHEETS of our large corporations are also awash in liquidity—and they mostly are sitting on their trillions of dollars of cash or using it to buy back shares, rather than investing in new ventures that would promote growth. But there is little the Fed can do about getting corporations to deploy this liquidity because this requires fiscal-policy initiatives that we haven’t seen since the Washington gridlock commenced six years ago. It would also require the monetary authorities in Europe and Japan to stimulate growth in their stagnant economies. The Fed’s recent announcement increasing the dollar amount of reverse-repurchase transactions in which it will participate seems intended to position the FOMC to deal with the transition problems in moving back to reliance on trading short-term Treasuries as its means of controlling rates. Doing more reverse-repurchase transactions will provide the FOMC with additional capability to push up the interest rate paid in the market for reverse repos, and thus provide upward pressure on the fed-funds rate. Disposition of the Fed’s security portfolio poses a different set of problems. It will have to stop reinvesting principal repayments and let the assets run off their balance sheet. Selling them would create mark-to-market problems because the Fed has only $57 billion in capital to cushion losses that would result from portfolio devaluation because of rising rates. GAAP, however, doesn’t require a markdown of securities if they are held in a portfolio until fully paid down. Meanwhile, numerous legislative proposals to audit the Fed are lingering, including one for a centennial commission to review the past 100 years of monetary policy and make recommendations on redesigning the Fed—while Congress awaits receipt of the results of criminal and internal investigations regarding allegations of unauthorized disclosure of confidential FOMC information. Attempts to challenge the Fed’s political independence have been going on for decades, but not of the scope and depth reflected by these recent actions. As more becomes known about how the FOMC has painted itself, and the nation, into a corner with its unconventional monetary policy, such legislative interest and concern will intensify. It’s time for the Fed to batten down the hatches and garner all of the political support it can to survive this onslaught. JIM KUDLINSKI was director of the Division of Federal Reserve Bank Operations and an official of the Fed’s board of governors from 1971 to 1981. He is author of the 2014 book The Tarnished Fed. He lives in Overland Park, Kan.
A humanitarian crisis threatens the future of Western institutions. What a crisis Europe is in, with waves of migrants reaching its shores as the Arab world implodes. It is the biggest migration into Europe since the end of World War II and is shaping up to be its first great and sustained challenge of the 21st century. It may in fact shape that continent’s nature and history as surely as did World War I. It is a humanitarian crisis. As Richard Haass of the Council on Foreign Relations notes, it will not soon go away, for two reasons. First, the Mideast will not be peaceful anytime soon and may well become more turbulent. Second, “The more that Europe responds the more it will reinforce the supply of migrants. Europe is caught.” If it doesn’t respond with compassion and generosity it is wrong in humanitarian terms; if it does, more will come and the problem grows. “This is now part of the architecture,” says Mr. Haass. Three hundred eighty-one thousand detected migrants have arrived so far this year, up from 216,000 in all of 2014. Almost 3,000 died on the journey or are missing. The symbol of their plight is the photo of the 3-year-old Syrian boy, Aylan Kurdi, who drowned along with his mother and 5-year-old brother when their boat capsized near a Turkish beach. Just as horrifying is what was found inside a Volvo VOLVY 0.41 % refrigerated truck stranded on the shoulder of the A4 highway 30 miles from Vienna in late August. Inside were 71 bodies, including a 1½-year-old girl, all dead of suffocation. They’d been left there by human smugglers. It is a catastrophe unfolding before our eyes, and efforts to deal with it have at least one echo in America, which we’ll examine further down. According to the U.N. refugee agency, 53% of the migrants are from Syria, 14% from Afghanistan, 7% from Eritrea, and 3% each from Pakistan, Nigeria, Iraq and Somalia. Seventy-two percent are men, only 13% women and 15% children. Not all are fleeing war. Some are fleeing poverty. Not all but the majority are Muslim. The leaders of Europe have shown themselves unsure about what to do. It is a continentwide crisis that began in 2011, as Tunisians fled to the Italian island of Lampedusa. The following year, sub-Saharan Africans who’d migrated to Libya made for Europe after Muammar Gadhafi’s fall. Since then the European response has largely been ad hoc and stopgap. European Union President Jean-Claude Juncker has proposed a “permanent relocation mechanism” with EU members taking greater shares of the refugees, but it is unclear how exactly it would work. In many EU nations there will be powerful pushback. Like the crisis itself the pushback will build. Europe is in economic drift. As this newspaper has noted, even Germany is growing at only 1.6% a year. Welfare systems will be strained. Youth unemployment is already high. In Britain the crisis could contribute to a vote to leave the EU outright. There are fears, which the elites take lightly, that floods of displaced people will “alter the cultural balance of the country for ever,” as the columnist Melanie Phillips put it in the Times of London. The Gulf states have not offered a home to their Arab and Muslim cousins. Dutch right-wing leader Geert Wilders this week called the wave of migrants an “Islamic invasion” in parliamentary debate, “an invasion that threatens our prosperity, our security, our culture and identity.” A recent poll showed 54% of Dutch voters opposed to welcoming more than the roughly 2,000 refugees previously agreed to. Hungary is building a fence. Reading the popular press of Europe you see the questions. Do we not have a right to control our borders? 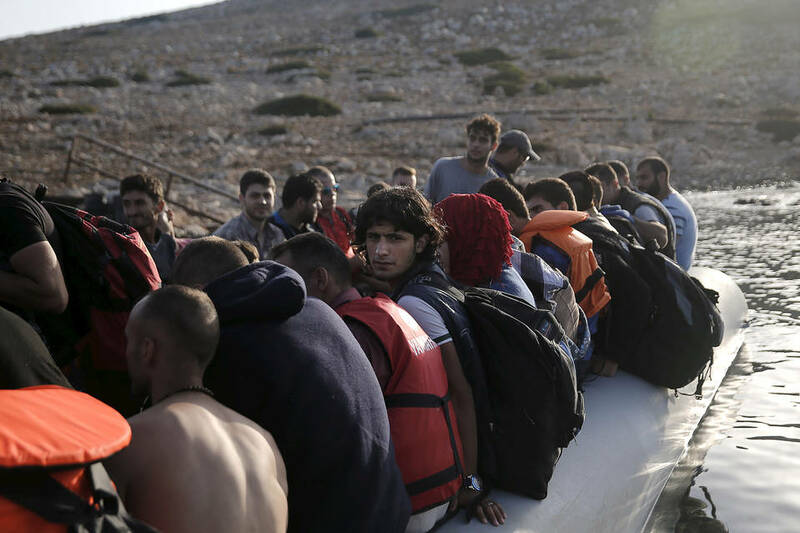 Isn’t the refugee wave a security threat? ISIS is nothing if not committed to its intentions. Why would they not be funneling jihadists onto those boats? Many things could be done to ease the crisis. States such as Jordan and Lebanon work hard to help refugees in neighboring countries and need help. Humanitarian relief is needed for the internally displaced. Go after the human smugglers, patrol the waters, take in those who are truly fleeing war and truly desire to become a peaceful part of their new, adoptive homes. But here is a problem with Europe’s decision-makers, and it connects to decision-makers in America. Damning “the elites” is often a mindless, phony and manipulative game. Malice and delusion combine to produce the refrains: “Those fancy people in their Georgetown cocktail parties,” “Those left-wing poseurs in their apartments in Brussels.” This is social resentment parading as insight, envy posing as authenticity. But in this crisis talk of “the elites” is pertinent. The gap between those who run governments and those who are governed has now grown huge and portends nothing good. Rules on immigration and refugees are made by safe people. These are the people who help run countries, who have nice homes in nice neighborhoods and are protected by their status. Those who live with the effects of immigration and asylum law are those who are less safe, who see a less beautiful face in it because they are daily confronted with a less beautiful reality—normal human roughness, human tensions. Decision-makers fear things like harsh words from the writers of editorials; normal human beings fear things like street crime. Decision-makers have the luxury of seeing life in the abstract. Normal people feel the implications of their decisions in the particular. The decision-makers feel disdain for the anxieties of normal people, and ascribe them to small-minded bigotries, often religious and racial, and ignorant antagonisms. But normal people prize order because they can’t buy their way out of disorder. People in gated communities of the mind, who glide by in Ubers, have bought their way out and are safe. Not to mention those in government-maintained mansions who glide by in SUVs followed by security details. Rulers can afford to see national-security threats as an abstraction—yes, yes, we must better integrate our new populations. But the unprotected, the vulnerable, have a right and a reason to worry. Here is the challenge for people in politics: The better you do, the higher you go, the more detached you become from real life. You use words like “perception” a lot. But perception is not as important as reality. The great thing in politics, the needed thing, is for those who are raised high in terms of responsibility and authority to be yet still, in their heads and hearts, of the people, experiencing life as a common person on an average street. The challenge is to carry the average street inside you. Only then, when the street is wrong, can you persuade it to see what is right. The biggest thing leaders don’t do now is listen. They no longer hear the voices of common people. Or they imitate what they think it is and it sounds backward and embarrassing. In this age we will see political leaders, and institutions, rock, shatter and fall due to that deafness. TOKYO — Visitors to Japan are often surprised by how prosperous it seems. It doesn’t look like a deeply depressed economy. And that’s because it isn’t. Unemployment is low; overall economic growth has been slow for decades, but that’s largely because it’s an aging country with ever fewer people in their prime working years. Measured relative to the number of working-age adults, Japanese growth over the past quarter century has been almost as fast as America’s, and better than Western Europe’s. Yet Japan is still caught in an economic trap. Persistent deflation has created a society in which people hoard cash, making it hard for policy to respond when bad things happen, which is why the businesspeople I’ve been talking to here are terrified about the possible spillover from China’s troubles. Deflation has also created worrisome “debt dynamics”: Japan, unlike, say, the United States after World War II, can’t count on growing incomes to make past borrowing irrelevant. So Japan needs to make a decisive break with its deflationary past. You might think this would be easy. But it isn’t: Shinzo Abe, the prime minister, has been making a real effort, but he has yet to achieve decisive success. And the main reason, I’d argue, is the great difficulty policy makers have in breaking with conventional notions of responsibility. Respectability, it turns out, can be an economy-killer, and Japan isn’t the only place where this happens. As I said, you might think that ending deflation is easy. Can’t you just print money? But the question is what do you do with the newly printed money (or, more usually, the bank reserves you’ve just conjured into existence, but let’s call that money-printing for convenience). And that’s where respectability becomes such a problema. When central banks like the Federal Reserve or the Bank of Japan print money, they generally use it to buy government debt. In normal times this starts a chain reaction in the financial system: The sellers of that government debt don’t want to sit on idle cash, so they lend it out, stimulating spending and boosting the real economy. And as the economy heats up, wages and prices should eventually start to rise, solving the problem of deflation. These days, however, interest rates are very low in most major economies, reflecting the weakness of investment demand. What this means is that there’s no real penalty for sitting on cash, and that’s what people and institutions do. The Fed has bought more than $3 trillion in assets since 2008; most of the cash it has pumped out there has ended up just sitting in bank reserves. How, then, can policy fight deflation? Well, the answer currently being tried in much of the world is so-called quantitative easing. This involves printing a very large amount of money and using it to buy slightly risky assets, in the hope of doing two things: pushing up asset prices and persuading both investors and consumers that inflation is coming, so they’d better put idle cash to work. But is this sufficient? Doubtful. America is recovering, but it has taken a long time to get there. Europe’s monetary efforts have fallen well short of expectations. And so far the same is true of “Abenomics,” the bold — but not bold enough — effort to turn Japan around. What’s remarkable about this record of dubious achievement is that there actually is a surefire way to fight deflation: When you print money, don’t use it to buy assets; use it to buy stuff. That is, run budget deficits paid for with the printing press. Deficit finance can be laundered, if you like, by issuing new debt while the central bank buys up old debt; in economic terms it makes no difference. But nobody is doing the obvious thing. Instead, all around the advanced world governments are engaged in fiscal austerity, dragging their economies down, even as their central banks are trying to pump them up. Mr. Abe has been less conventional than most, but even he set his program back with an ill-advised tax increase. Why? Part of the answer is that demands for austerity serve a political agenda, with panic over the alleged risks of deficits providing an excuse for cuts in social spending. But the biggest reason it’s so hard to fight deflation, I contend, is the curse of conventionality. After all, printing money to pay for stuff sounds irresponsible, because in normal times it is. And no matter how many times some of us try to explain that these are not normal times, that in a depressed, deflationary economy conventional fiscal prudence is dangerous folly, very few policy makers are willing to stick their necks out and break with convention. The result is that seven years after the financial crisis, policy is still crippled by caution. Respectability is killing the world economy. IN 1951 a group of diplomats in Geneva committed their countries to absorbing huge numbers of refugees from a region plagued by ethnic hatred, fanatical ideologies, and seemingly interminable war: Europe. The second world war left millions of people wandering across the ravaged continent. Poland, Czechoslovakia and the Soviet Union deported 14m Germans in the years after Germany’s defeat. 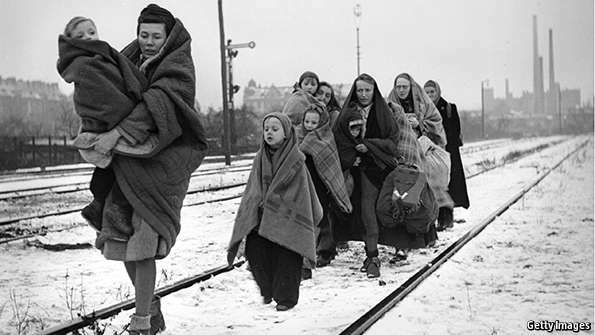 Redrawn borders saw millions of Ukrainians, Serbs and others kicked out of their homes. Six years on, 400,000 people were stranded in “displaced persons” camps with no clear prospect of resettlement. The UN-mandated Geneva conference came up with a convention that required its signatories to assess claims to refugee status made by anyone in their territory, and to grant it whenever a refugee had a “well-founded fear of being persecuted” in his or her country of origin. To begin with the right of asylum was limited to Europeans, but this limitation was removed when a new protocol gave the convention global scope in 1967. 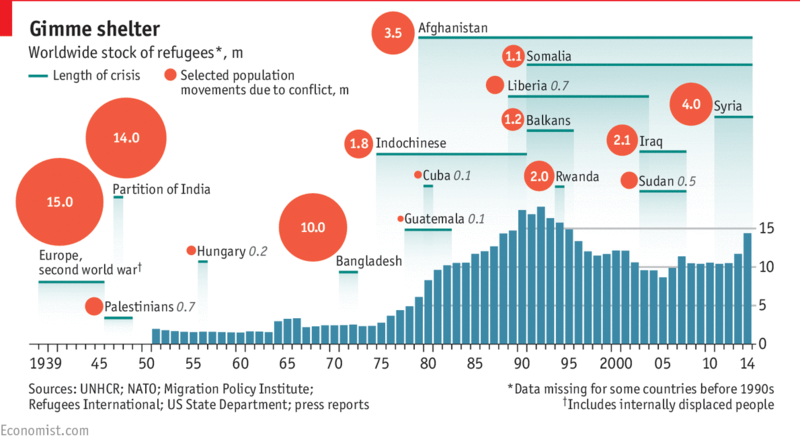 The Refugee Convention has now been ratified by 147 countries; over 64 years it has framed the international response to humanitarian crises around the world (see chart 1). The convention’s adoption marked one of the “never again” moments of the post-war era, with states pledging themselves to overcome the modern evils their war had made manifest. The hundreds of thousands of refugees who have streamed across Europe this summer have both recalled that pledge and called it into question. For months refugees from Syria, Afghanistan and Eritrea have been retracing the routes used by European refugees in the 1940s. They pick their way through razor-wire fencing on Serbia’s northern border, where ethnic Hungarians once fled Titoist partisans. They are smuggled in trucks across Austria, just as Jews headed from Poland to Palestine once were. But this time the flow is moving in the opposite direction: towards Germany. In early September a new mood of welcome for these refugees sprang up in western European countries, and especially in Germany. But central and eastern Europe have not joined in the enthusiasm. Viktor Orban, Hungary’s prime minister, has turned into a bête noire for liberal Europeans, putting up barbed wire and walls against refugees and treating those who get in like cattle, appearing insensitive to associations with Nazi concentration camps or East Germans fleeing across Hungarian barbed wire 26 years ago. A poll this month in the Czech Republic showed 71% of the population opposed to taking in any refugees at all. Slovakia has made it known that, if it must have refugees at all, it would rather not have Muslims, a sentiment echoed by right-wing politicians across the continent happy to play on animosity towards Muslims and fears that Europe is incapable of absorbing them. The migrants are looking for European social benefits, the populists say, not fleeing persecution. The Netherlands’ Geert Wilders calls them gelukszoekers (“happiness-seekers”), while Mr Orban says the “overwhelming majority” are economic migrants. After all, the argument runs, those fleeing Syria mostly cross into Greece from Turkey, where they face no physical threats. Surely that means they are not real refugees? Wrong. For one thing, a quirk of history means that though Turkey has signed the convention, it does not grant Syrians the right to stay there as refugees. It is the only country that, when ratifying the 1967 protocol to the convention, retained the original geographical limitations. 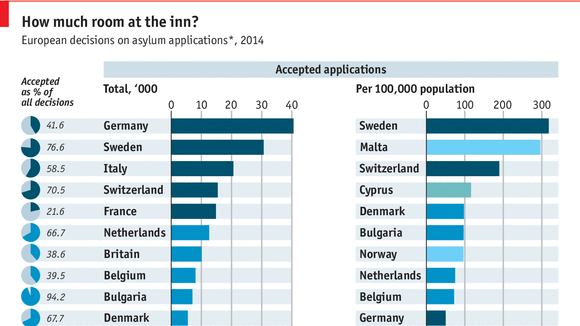 Thus the convention only obliges Turkey to deal with asylum applications from Europeans. More generally, state signatories to the convention are obliged to let those who have applied for asylum stay while their applications are evaluated, whether they have arrived via other countries where they might not face persecution or not. Soviet Jews who requested asylum in America in the 1970s were not rejected simply because they had first passed through Austria. There are exceptions. The European Union’s Dublin rule says that people applying for asylum in an EU country other than the one they first entered should be returned to that first country. And international law permits applicants to be sent to “safe” countries that afford equivalent opportunities for asylum. 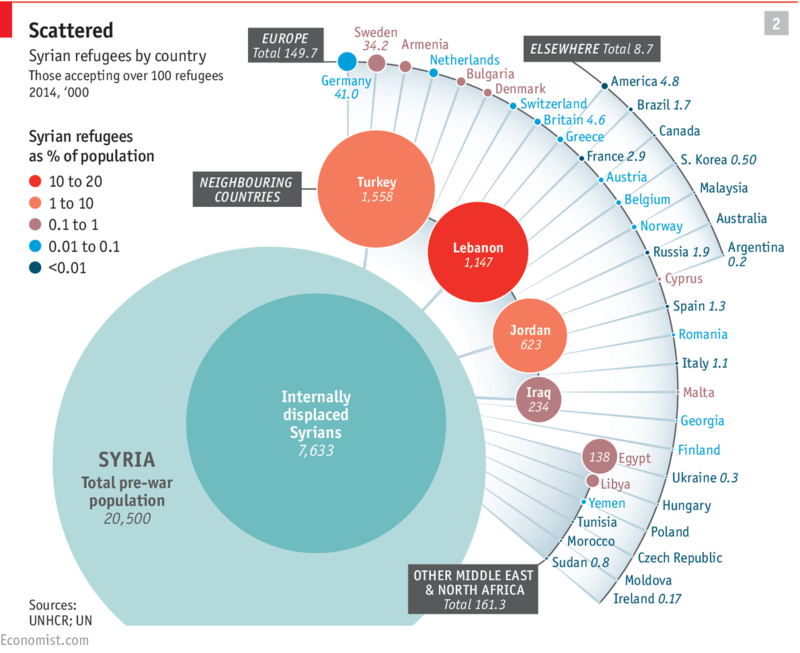 But this does not mean they can be returned to the Middle East—where most of Syria’s refugees remain (see chart 2). Neither Lebanon nor Jordan is a signatory to the convention, and though both have taken in far more refugees than Europe, the situation in both is now far from welcoming. Over the past year Lebanon has put into place tortuous rules that require its 1.5m Syrians either to pledge not to work or to find Lebanese sponsors—which often means getting exploited as unpaid labour. Jordan, with 629,000 refugees living mainly among local communities, has been ramping up restrictions that seem aimed at squeezing them into camps or forcing them to leave. Lacking the convention’s protections, most Syrians in Jordan, Lebabon and Turkey are unable to work legally, and live in dire poverty. The World Food Programme has halved its assistance to the neediest Syrian refugees, providing just $13.50 per person per month. In Turkey, Kurdish Syrian refugees are vulnerable to the government’s renewed war against its own Kurds. Arrivals in Europe have rocketed this year not so much because the civil war is worse than ever—though it is—as because the situation in the countries neighbouring their homeland has grown desperate. For all this, some reluctant Europeans continue to be certain the new arrivals are not “real” refugees. If so something is gravely wrong with EU asylum authorities, which are convinced that most of the applications they are seeing are genuine. 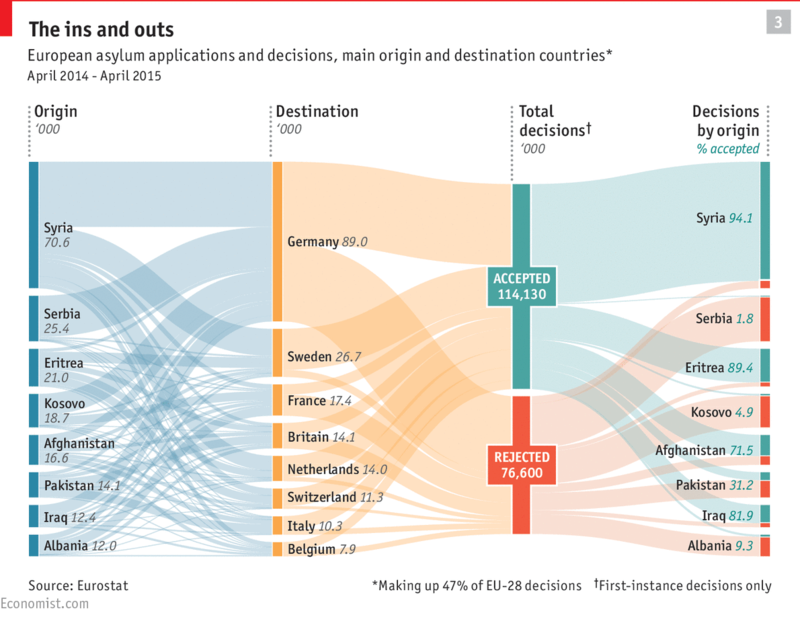 European countries grant asylum to 94% of Syrian migrants who ask for it, along with the vast majority of Eritreans, Afghans and Iraqis (see chart 3). This is not to say there are no economic migrants trying to get into the EU. Most applications for asylum from Serbia, Albania and Kosovo are rejected. Many sub-Saharan Africans who make it across the Mediterranean to Italy and Malta do not try to show that they are persecuted, hoping instead to make their way undocumented. As a prosperous continent next door to much poorer places, Europe can expect ever more such migration over the years and decades to come. But that does not mean that it can ignore the growing flux of refugees who have a claim to protection under the convention. When the fear that few of the migrants will qualify as refugees proves unfounded, it is likely to be followed by a fear that too many of them will—especially now that Germany has put out the welcome mat. There are 4m Syrian refugees outside Syria. Even if they all came to the EU they would amount to a small demographic change in a club of more than 500m people—if evenly spread. Under the Dublin rule Greece and Italy have handled a share of asylum-seekers they see as deeply unfair, but Germany has already put those rules to one side as far as Syrians are concerned, and the rest of the EU is working on a quota system to make the distribution more even. Yet on a continent where, for a decade and a half, politicians have been preoccupied with the failure to integrate Muslim communities—and where that failure has boosted the likes of Marine Le Pen’s National Front in France and Mr Wilders’s Party for Freedom—the prospect of more such communities worries many. How easily Europe can absorb more Muslims depends largely on how the absorbing is done. To appease anxieties over costs and crime governments often restrict asylum applicants’ work permits and house them in isolated refugee centres. This is the most expensive and least effective approach possible. Putting asylum-seekers into government-run centres is not only alienating, it also costs a lot more than housing in the community—about €100 a day per person, according to a British study. Letting asylum-seekers work—if, in areas of chronic unemployment, they can find jobs—replaces the costs of government relief, and leads them to learn the local language much faster. That said, letting them work has costs that are not evenly shared. German studies of the labour effects of immigration suggest that while it raises the incomes of better off workers with complementary skills, it does some harm to those who already have low wages. Success also depends on who does the absorbing. European nation-states have been coping with acute refugee flows at least since the Protestant exoduses of the Thirty Years’ War—that is, for as long as there have been European nation-states. But the immigrant nations of the Americas and Australia have tended to do a better job, and any resolution of the Syrian crisis should probably involve them as well. One model might be the Vietnamese “boat people” crisis that started in the late 1970s and unfolded in much the same way the Syrian diaspora has. Initial uncontrolled emigration led to resistance from neighbouring countries and tragic drownings that mobilised public opinion in the West. So the international community set up camps for processing and distributing asylum applicants. Some were repatriated, while deals with Vietnam let others leave legally. Some 1.3m refugees from Indochina ended up in America; many others went to Australia, Canada and France, and some to other parts of Europe. The boat people had fewer skills than the refugees who had first fled the fall of South Vietnam in 1975, and less ideological identification with the West. In Australia they became the first large group of Asian immigrants in an overwhelmingly white colonial population sensitive to preserving its ethnic identity. Yet today the boat people are for the most part a success everywhere they ended up. Vietnamese-Americans have lower levels of educational attainment and English proficiency than the average American immigrant, but higher income levels and naturalisation rates. If an analogy between Vietnam’s boat people and Syria’s migrants seems glib, it is because of a widespread sense in Western countries that Muslims are more threatening than other immigrants. The fear is not just of Muslims’ cultural differences, but of the development of anti-Western political sentiment in Muslim communities. Islamist terrorist attacks in Europe this year have intensified such anxieties. But every wave of immigration has been accompanied by fears. In 1709 the War of the Spanish Succession sent thousands of refugees from lower Saxony down the Rhine and across the North Sea to London. Believing that they would then be offered free passage to America, the so-called “Poor Palatines” instead ended up in refugee camps. Daniel Defoe and other Whigs argued that they were Protestant refugees from Roman Catholic oppression and should be settled in England—an argument that suffered a blow when, on closer inspection, half the Palatines turned out to be Catholic themselves. A Tory faction meanwhile argued that they were economic migrants, low-skilled undesirables who would prove an endless burden on the Crown. Ultimately, investors were found to put some of them on boats to America, where they founded Germantown, New York. America itself, though often welcoming, has also had its periods of doubt. The millions from southern and eastern Europe who arrived at the end of the 19th century provoked fears that the “English-speaking race” could not withstand such pollution. After 1945 America refused for years to accept any refugees from eastern Europe: Senator Chapman Revercomb of West Virginia warned it would be “a tragic blunder to bring into our midst those imbued with a communistic line of thought”. These fears, like those over Islamist terrorism today, were not baseless. In the 19th century some eastern European immigrants in Western countries engaged in anarchist terrorism; in the 20th some spied for the Soviet Union. But these were not, in the end, huge problems. In one respect, though, today’s refugees and migrants truly are different from those of earlier eras. Many have some higher education, material resources and networks of family or friends already in Europe with whom they can keep in touch through phone and Facebook. Some are working out their plans as they go, others have coherent strategies. In a word, they have agency. On September 6th, at the railway station of the small Austrian village of Nickelsdorf, Waleed al-Ubaid stood waiting to catch a train towards the German city of Kiel. He had researched it on his phone: “So many Syrians are going now to Munich and Berlin. It’s better to go where there aren’t too many.” Nearby on the platform Hussein Serif plans to find a job in Germany, then apply for a scholarship at the French business school, INSEAD (he had just finished a marketing degree when, at risk of being drafted, he left Damascus). Millions of Mr Serif’s compatriots are still waiting in Turkey, Lebanon and Jordan, gradually despairing of their prospects there. They are aware of their rights under the convention; they know of the successes and failures of their friends and family through social media. Many of them will probably be coming west soon. Europe has the capacity to welcome them; at the moment, in many places, it has the inclination to do so, too. The challenge is to turn that warm and decent impulse into a programme that will make the newcomers safe, productive and accepted. A crucial cycle is presently occurring! A crucial Shimitah cycle is presently occurring! It is a cycle that was first observed by the Jewish people while living in the Holy Land. Every cycle culminates in a Sabbatical year, (7th year) known as Shemitah; literally translated means “to release.” This Shemitah 7 year cycle is occurring at the same time that the American economy appears to be “on life support”. After so much excitement within the last couple of weeks, the markets have been somewhat anticlimactic. Which way will we go? Bullish or bearish? I believe, we are totally CONFIRMED bearish, and expecting a re-test of previous lows. We may even see, within the Dow Jones Industrial Average, a lower low, down around 15,000. Lately, the volatility has stabilized and THE MARKETS HAVE BEEN CONSOLIDATING. The base is about 1,000 points so that when the breakout does occur, I expect a move of about that same size. When I decipher my charts, it looks as though this breakout should happen within the month of September, and/or early October 2015. If it breaks bearish, the news media will likely blame it on the FOMC meeting, and if it breaks bullish, they will, most likely, blame it on the Federal Reserve. This nation has never experienced six years of hyper-low interest rates before! What impact has this had on the restructuring of the balance sheets of insurers and banks? In striving to match assets and liabilities, across 24 consecutive quarters of near-zero rates, what deception might financial institutions have inflicted (reaching-for-yield through derivative positions) that could backfire, and trigger a financial crisis! It will result in a strong price movement. If the market thinks honestly, the investment community seems much closer to panic and hysteria than it does to euphoria and optimism. It would not take much more to depress the markets further; however, it would take a lot to make it feel confident and secure about the Fed’s ability to stay ahead of “the curve” and manage the transition smoothly. The SPX is very similar, in structure, in relation to the Dow. It appears as if it was ready to complete its triangle formation, but the pattern has continued to expand into a symmetrical triangle. A triangle normally forecasts a continuation of the trend, which existed prior to its formation; more weakness ahead continues to be the logical forecast. This is also supported by important cycles which should not make their lows until late this September and/or early October 2015. Since the SPX reached 1,865, it has worked its’ way into a consolidation pattern, which has the appearance of a triangle. If it is a symmetrical triangle, the odds are in favor of a continuation of the selling, after the pattern is completed. This could happen as early as this coming Thursday, September 17th, 2015, when the Fed will announce its decision on interest rates, but since the indexes could also stage a surprise move, in the opposite direction, it is best to wait until we are past that critical period and before hazarding a short-term forecast. The NASDAQ has a slightly different formation. This one looks like an ascending triangle. Statistically, there is not much difference between ascending and descending triangles. Outside of this triangle formation, the NASDAQ looks like the others do, for the most part. The 100 and 200 simple moving averages have not yet crossed bearish; however, they are headed sideways. I am foreseeing the area around 4,850, as resistance. Otherwise, I see much of the same signals as the other two indexes. Global Stock markets had modestly rallied last week, following their most serious dramatic plunge since 2011; which lasted from July 20th, 2015 into August 26th, 2015 (declines of over 15%) which occurred in that brief five week period within most of the world’s indexes. Some were much worse. The German DAX, for instance, fell nearly 21% within that time frame, and down nearly 25% from its yearly high, in April 2015. The Chinese Shanghai Index plunge was even more disturbing. Prices dropped nearly 45% from their yearly high of June 15th, 2015. Thus, a rally from that first leg down was well overdue, which has now lasted nearly three weeks. However, the markets’ form has been unimpressive, and more indicative of a corrective retracement within a bear market, rather than the start of a new bull campaign. This week’s highly anticipated Fed announcement of a rate hike, which is due out on Thursday, September 17th, 2015, nearly guarantees that the bullish or bearish argument in equities, around the world, will be revealed. One course would set the indexes on a bullish trajectory and the other on a bearish one. The rallies off of the lows of August 24th through the 26th of 2015, seem to be losing momentum. Not that they ever had very much to begin with. There have been sharp up days, but, in almost all instances (like last week) they were quickly followed by sharp down days. We are all currently waiting for Dr. Yellen’s announcement. This should be a rather shocking announcement to hear, globally! If one thinks that some world leaders have been judgmental in their policies and behaviors, then you have not seen anything yet, unlike what you are about to witness now, well into 2016, and even into 2017. 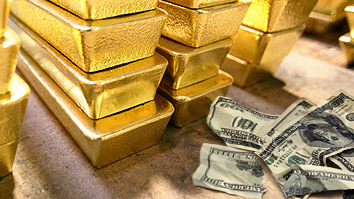 While the stock market appears to be on hold during this week’s Fed meetings, gold and silver were also unimpressive. Gold fell below $1100.00/oz., again, during Friday’s session, September 11th, 2015. GLD should retrace itself down to 100 before any BULLISH/BUY confirmation will be given. Silver tried to rally above $15.00/oz., but could not do so after Wednesday, September 9th, 2015, and began a retreat down to $14.25/oz. during Friday’s trade. Bearish trends of this week are extremely potent. They coincide with the Fed meeting this Thursday, September 17th, 2015, which is expected to result in dramatic market moves. These spurts may still be short-lived, but the amplitude, in any direction, is likely to be both sharper and greater than it is, in any given day. Possibly, two or three days. The Bank of China devalued the Yuan and depegged it from the US Dollar, most likely, because the leaders of China did not want the Fed to raise US interest rates. Higher US interest rates mean a higher US Dollar value. We are still in a global race to the bottom in currency values, as well as we are in the currency wars zero interest rates policy era of the continued quantitative easing. A rising currency is seen as hurting a nation’s balance of trade. Hence, the unexpected surprise move made by China, has temporarily worked, on a short-term basis. It had paralyzed the Fed’s expected action to raise interest rates. The Federal Reserve has delayed the expected rate hike, until now. If they do not raise their bench mark interest rates, the US risks the possibility of negative interest rates. I foresee the “hidden signs” that the Federal Reserve will slightly raise its bench market interest rate, which will result in the selling of stocks, following their announcement. WASHINGTON, DC - MAY 20: Newly redesigned $100 notes lay in stacks at the Bureau of Engraving and Printing on May 20, 2013 in Washington, DC. 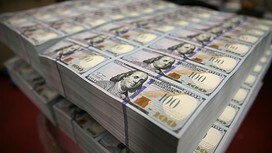 The one hundred dollar bills will be released this fall and has new security features, such as a duplicating portrait of Benjamin Franklin and microprinting added to make the bill more difficult to counterfeit. America’s monetary priesthood convenes next week amid more than the usual scrutiny. It has been 11 years since the Federal Reserve last initiated a tightening cycle, and the fateful moment of lift-off may now approach, if not at this meeting then at least before Christmas. But whatever the Fed’s interest-rate committee determines, we can be sure of one thing: few will doubt its competence. Gone are the days when theFed was a holding pen for cronies and chancers — placemen such as the redoubtable James K Vardaman Jr, appointed to reward his service as a plodding presidential aide, sworn into office in 1946 in the full regalia of a navy commodore. Do modern central bankers deserve their exalted reputations? In one sense, yes: like the economics profession writ large, they have become more scientific and sophisticated. But in another sense there is a danger in pushing this reverence too far. 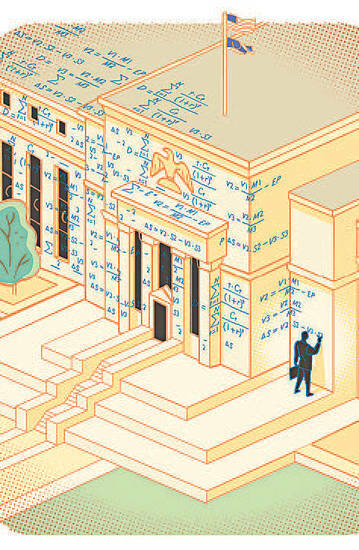 The Fed still grapples with surprisingly basic questions about its purpose. Should it stabilise inflation, or a combination of growth and inflation, or perhaps employment, or maybe even asset prices? And how, for that matter, do its tools really work? By toggling short-term rates, the Fed hopes to guide the more important long-term ones that matter to homebuyers and businesses, but the transmission mechanism is unstable. As for quantitative easing and the rest of the modern monetary toolkit, it is a work of improvised brilliance, dazzling and yet prone to fail. It is not a trusty set of spanners. When it comes to unmasking the uncertainties behind the Fed’s technocratic façade, the transcripts of past interest-rate meetings are a boon to historians. A particularly fine example is to be found in the transcript of February 1989, when the Fed’s doctrinal confusion was at one of its high points. Back then the Fed was still operating in a monetarist fashion: it steered the economy by tinkering with the quantity of credit available to households and businesses, which it did by manipulating banks’ financial reserves and hence their lending capacity. At the same time, the Fed’s attention was shifting from the quantity of credit to its price — from the money supply to the interest rate. Caught awkwardly between two approaches, the Fed tried to have it both ways: it would adopt a target for the supply of credit, but also assume a target interest rate. Cue confusion. At one point in the February 1989 meeting, Alan Greenspan, the chairman, proposed keeping the money-supply target constant. Richard Syron of the Boston Fed worried that this status-quo course might actually lead to looser policy as measured by the Fed’s key short-term rate — the federal funds rate. “We might see some decline in rates,” Mr Syron suggested. “Under your proposal you would not want to see a decline in rates in the short term,” Mr Syron persisted. “Do you mean the funds rate?” Mr Greenspan asked this time. “What funds rate level would that be?” asked Thomas Melzer, president of the St Louis Fed. “Where we are right now,” Mr Greenspan responded. “9 1/4 per cent?” asked Mr Melzer. “9 1/8 per cent,” somebody answered. “9 to 9-1/8,” another voice corrected. “Did we clarify that?” Mr Greenspan asked. “Yes,” Mr Melzer declared, courageously. Could it be that, behind the veil, today’s Fed leaders are equally muddled? One presumes not; and yet they and their foreign counterparts are evidently stumped by two big challenges. The first is low inflation. The major central banks have jabbed at their economies with newfangled monetary cattle prods for years, but have failed to get inflation moving — and now the China shock threatens to subdue prices further. This creates a near-term danger of deflation, and Japan teaches us how hard it is to escape that deadly trap. But it is also a problem for the future. In the two US downturns before 2008, the Fed cut its policy rate by more than five percentage points to rekindle growth. Next time, central banks will begin with interest rates so low that it will be impossible to respond equivalently. The other big conundrum concerns asset prices. The 2008 crisis belied the notion that these could simply be ignored. But central bankers now want to contain bubbles not with interest rates but with regulation. Sadly, regulation is not up to the task. It is slow-moving, porous and, especially in the US, hamstrung by agency turf fights. Fortunately for the Fed, it need not advertise its frailties. Next week it will announce its decision; traders will swoop; the rest of us will marvel at the power of this unelected priesthood. But, in the not-too-distant future, this superman image may suffer two kinds of blow. Come the next recession, it may have to be budget stimulus, the handiwork of grubby politicians — not the monetary stimulus ordained by central bankers — that rides to the rescue. And come the next financial bubble, the inadequacy of regulatory countermeasures will be painfully exposed. The priesthood, after all, is fallible. Are We On The Precipice Of Another 2008? When it comes to the recent market turmoil people are quick to make two comparisons - 1998 or 2008. The first big difference between today and the 2008 period before the financial crisis is that private sector balance sheets are far healthier. 2008 wasn't a banking crisis or a "financial" crisis. It was a credit crisis. What this environment does look like is 1998. 1998 was an emerging market crisis that slammed foreign stocks, commodities and currencies. When it comes to the recent market turmoil people are quick to make two comparisons - 1998 or 2008. Both were "crisis" type events that led to big stock market declines and substantial economic turmoil, but 2008 was far more traumatic. There are some important distinctions between the two environments so let's look at the macro picture and see if we can better understand where we are and where we might be headed. I should start by pointing out that the only reason this website even exists is because of 2008. For those who have been reading me for the last 5 years thinking I am a permabull, I can assure you that's wrong. I was often called a permabear from 2008 through early 2010 (yes, I was late to the recovery). My first posts here (see here, here and here for example) were anonymous thoughts I was hashing out at the time (mostly for my client letters). As someone who was fairly immersed in the mechanics of banking and endogenous money, I was extremely worried about a debt deflation style event that was occurring due to the housing market collapse. And while I was worried, I have to admit that things turned out even worse than I expected. The contagion was far worse than I knew. Still, given my understandings of the monetary and financial system, I had a pretty darn good grasp on what was going on at the time. And let me be very clear - what we're seeing today is NOT 2008. The first big difference between today and the 2008 period before the financial crisis is that private sector balance sheets are far healthier. 2008 wasn't a banking crisis or a "financial" crisis. It was a credit crisis. This distinction is important because it was the surge in private credit that led directly to overpriced homes which led to Wall Street securitizing those debts. In essence, we had leverage on top of leverage. And when the product supporting all that leverage (housing) collapsed it led to a domino effect. The credit markets today are far healthier than they were in 2008 and not directly attached to an uncontrollable bull market in the most important item in the private sector balance sheet (houses). Of course, government debt has surged and offset much of this deleveraging, but regular readers know that we don't have to worry too much about the potential for the US government to go bankrupt. 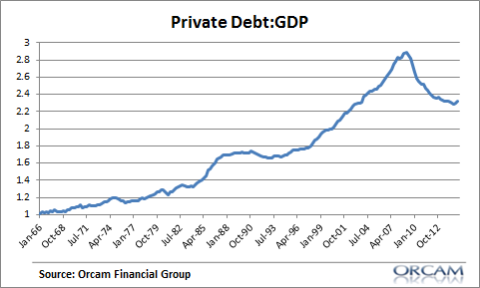 So that quantity of debt is far less worrisome and destabilizing than the private sector's debts. Despite the turmoil abroad, the US economy appears to keep chugging along. Yes, growth isn't great and I still think we're "muddling through" from the financial crisis, but it's still not as bad as some make it out to be. In 2008, the key domino was housing. Once the housing domino tipped, it led to widespread job cuts. You might not remember, but the labor market in 2008 was very bad. In fact, the unemployment rate had been rising since 2006. 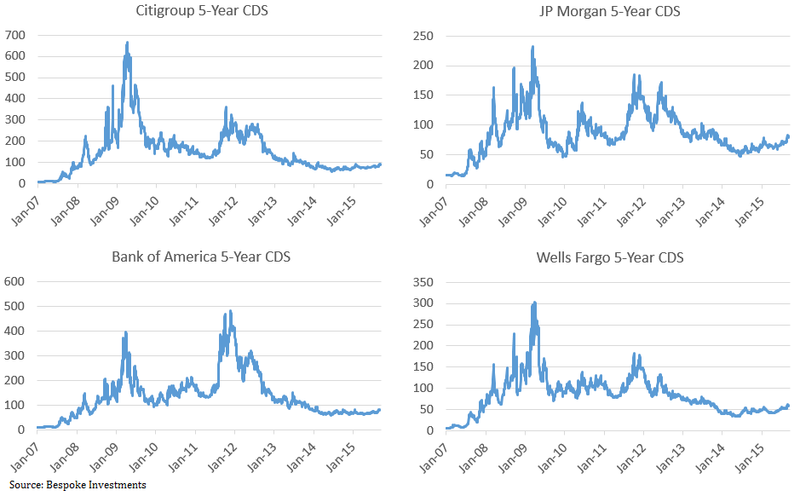 The credit crisis was like a slow motion train wreck that actually unfolded over the course of several years. This does not remotely resemble today's labor market. 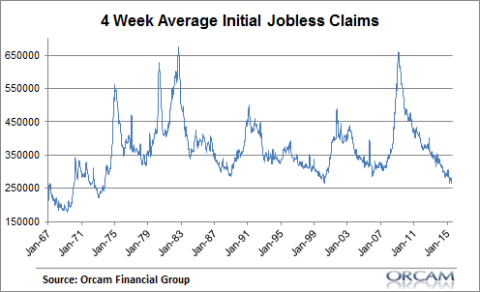 In 2008, we were 8 months deep in consecutive job losses. We'd lost an average of almost 75K jobs per month when the financial crisis struck in August 2008. This time around we have yet to see a negative month. 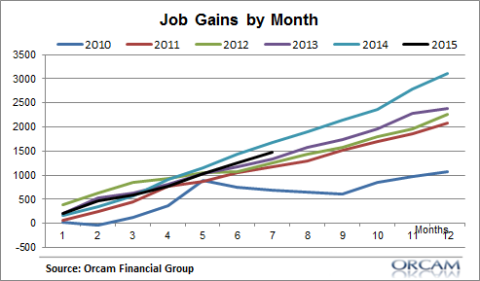 In fact, 2015 is shaping up to be one of the better employment years of the recovery. It's also worth noting that the regulations that were put in place following the crisis have led to much higher capital ratios. US banks have a much bigger cushion for downside than they did in 2008. What this environment does look like is 1998. 1998 was an emerging market crisis that slammed foreign stocks, commodities and currencies. But the issues were relatively contained. In fact, the USA boomed in 1999. So much so that stocks surged irrationally on the platform of fear that 1998 created and led directly to the blow off top in the Tech Bubble. Even emerging market stocks made a huge comeback in 1999, as markets realized the panic might be overblown. Of course, the unknown here is China. And I don't know if anyone fully understands what's going on with the Chinese economy. But one thing is clear. If China is the slow motion credit train wreck analogous to 2008, then this too should be relatively contained to China and its most interconnected economic partners. And the biggest reason why this is likely to be contained is because China's banking system is mostly state owned. Remember, the 2008 crisis didn't really end until the US government put its full faith and credit behind the US banking system. But China already has this in place. China's biggest banks won't be allowed to default or even come close. In essence, the AIG plan for China has always been in place. China's biggest banks aren't just too big to fail. They are infallible. Interestingly, if you look at GDP and labor market trends in 1998, they look eerily similar to today's environment. While the 1998 emerging market crisis unfolded, US GDP hardly budged. And the unemployment rate continued to drive lower into late 1999. At the macro level, the emerging market crisis didn't have much impact on the world's most important economy. Of course, it's always different this time. No two environments are exactly alike. And I shouldn't downplay some of the potential risks in the USA at present. There has been a lot of margined buying of equities, a buyback fueled bull market, weak economic growth, etc. So there are risks out there that could create the potential for stock market instability. The fact that stocks fall seems to surprise a lot of people who have become used to the recent stability, but what we've seen so far is little more than benign market action. Now, I am certainly no soothsayer. I simply look at the world we have, assess probable outcomes and position myself accordingly. And when I look at the macro picture, I see this environment as being one that looks a lot more like 1998 than 2008. And while that doesn't mean we shouldn't fear some downside in financial markets and the economy, it also doesn't mean we should be building bunkers and piling into gold.